Before I dive into this post, I want to mention that the City of Coquitlam Archives is hiring! We are looking to recruit a permanent, full-time, Archives & Records Officer. The successful applicant will split her or his time between the Archives and Records Management programs. It is a unique opportunity to be involved with the entire record life-cycle for a vibrant and growing municipality. For more information about the job and the eligibility requirements, click here. The posting closes December 28th at 5pm PST. Ok, here we go. I am amazed by the seemingly endless ways archival records are used by archival institutions, by researchers, by artists, by anyone who wants to engage with the past. Lately, I have been particularly impressed by a few projects that have developed creative ways of using archival records to intrigue, to educate, and to stimulate curiosity. By developing these wonderfully engaging projects, they have smashed the stereotypical image of a bespectacled researcher hunched over a dusty manuscript in an ill-lit research room and have made archival records exciting and captivating, bringing them into the digital world. 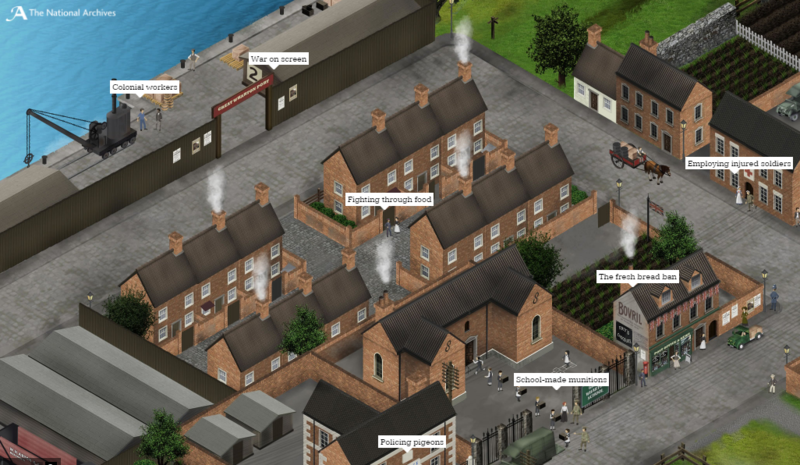 Visitors to Great Wharton can wander the virtual streets to learn about the fresh bread ban at the local bakery, or how children were employed for agricultural labour. These are just a couple of examples from the seventeen carefully crafted stories that use archival records to illuminate past experiences. 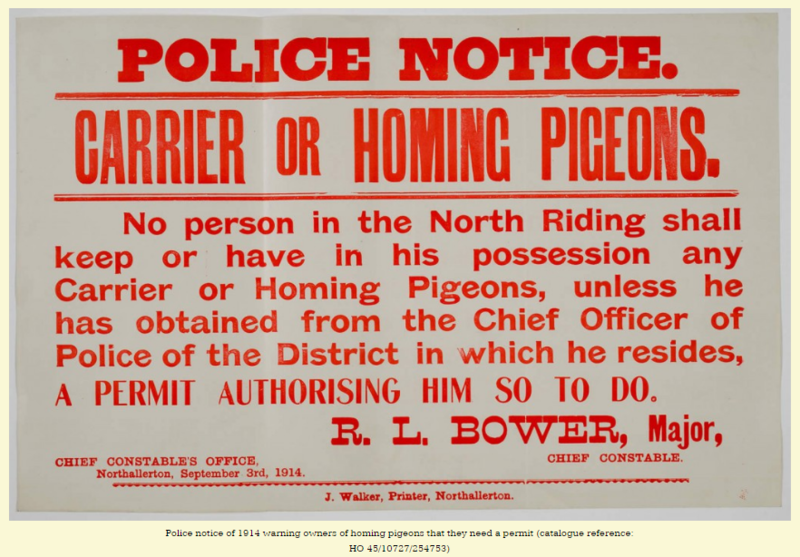 You can learn about women’s war work, strike actions, injured soldiers, how the scouts were called into action, or how carrier pigeons were subject to policing during the war. The National Archives has made using archival material an interactive, engaging process. You might not even realise that it’s designed to educate – it’s really quite fun. There is a also a great blog post all about the creation and user testing of the Great Wharton project, where you can read about how they made decisions about how to design the characters and how they responded to feedback from their beta user testing, including the addition of more digitized archival records. 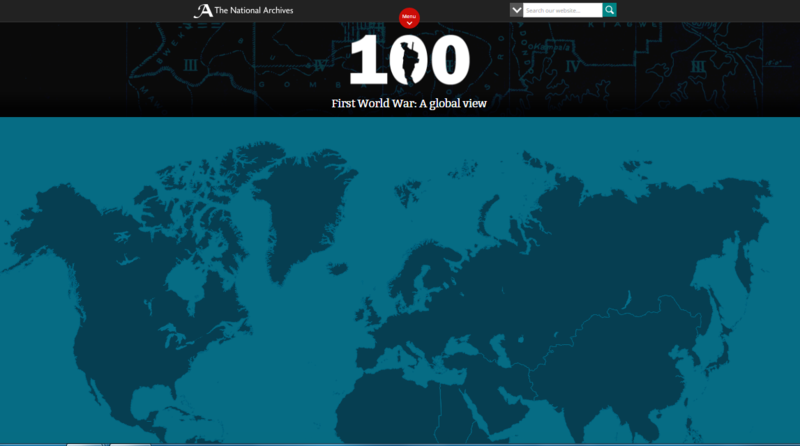 Sticking with the First World War homefront, the UK National Archives has also developed a fantastic interactive map as part of its 100th anniversary commemoration activities. The map allows users to “read about battles, life on a country’s or colony’s Home Front and much more. Each country or territory is illustrated with images, maps and other documents.” First World War: A Global View lets you discover information about a given region during the war: its population; it’s interaction with the Western Front; the situation on its Home Front; the different types of armed forces that were involved in the war effort; and descriptions of key figures. The site also provides links to related key documents held by the National Archives. This is another example of ingenuity and creative thinking on the part of the records and outreach teams at the National Archives. I am particularly impressed by the global nature of this initiative. 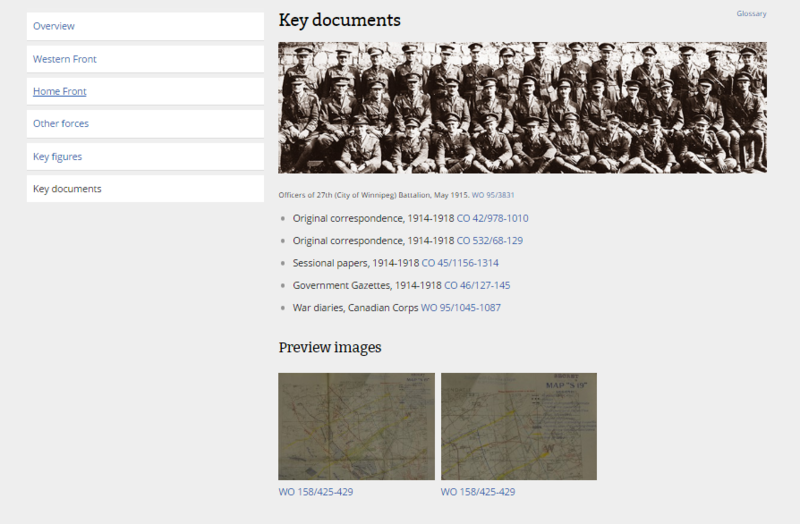 Closer to home, the North Vancouver Museum and Archives has produced a wonderful interactive web project that makes use of a significant archival fonds to bring a man to life and to tell the story of the First World War through his eyes. 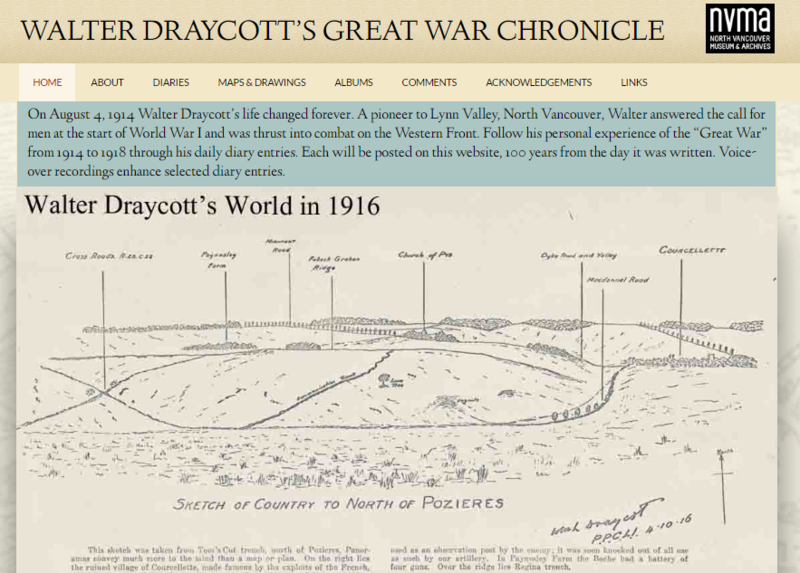 Walter Draycott, a military topographer from Lynn Valley, joined the war effort in 1914. The Great War Chronicle showcases Draycott’s diaries, maps, and sketches, enabling visitors to “follow his personal experience of the “Great War” from 1914 to 1918 through his daily diary entries. Each will be posted on this website, 100 years from the day it was written. Voice-over recordings enhance selected diary entries.” This project is a great example of a local municipal archives creating an engaging project that serves to broaden its reach. One of my favourite new blogs is 99% Invisible. A recent episode alerted me to a fascinating project that uses archival sound recordings, video, and official records. The Roaring Twenties is “an interactive exploration of the historical soundscape of New York City. According to the project’s author, Emily Thompson, “the aim here is not just to present sonic content, but to evoke the original contexts of those sounds, to help us better understand that context as well as the sounds themselves.” The website uses a series of archival records, including Noise Complaints in the Health Commissioner’s Papers, to explore the history of sound, as it was experienced in New York City in the early part of the 20th century. Perhaps, less educational in nature than the other projects, but no less entertaining (arguably more so), there is a trend emerging to use archival images and videos to produce GIFs – by far the internet’s greatest gift to the world. For all your historical GIF needs, the US National Archives offers a GIPHY channel, a manic-looking site where you can watch looped clips of vintage cars, or a turkey in a hat. Or if a turkey in a hat isn’t your bag, you can also find Elvis shaking hands with President Nixon, or watch the American flag being raised at Iwo Jima. On the GIPHY site, the GIFs themselves point back to the source material on the National Archives website, which helps to raise awareness of the digital content available from the organization. These GIFs serve to entrench historic images in our minds, reminding us of these important (and not so important) moments. Hopefully, these GIFs might prompt people to dig deeper to find out the stories behind the iconic images. I was also happy to find some Canadian content on the larger GIPHY site, including the Avro Arrow in flight and Terry Fox‘s epic journey across Canada to raise money and awareness for cancer research. The Digital Public Library of America (DPLA) has partnered with Imgur to create a series of GIFs as part of a project entitled, The Summer of Archives. You can read more about the project in this article from Smithsonian.com. In the article, Kenny Whistbloom of the DPLA, explains that, “there are a lot of opportunities for historical footage to be relevant to people through the gif and modern implications of technology…These sort of films aren’t on the forefront of the average internet users daily browsing habits, and yet there are stories in them that are interesting things that are actually quite relevant and cool.” GIFs may not be the most sophisticated method of disseminating archival content, but they are incredibly popular and I am all for creative uses for archival materials to make them relevant in the present. I am excited by the myriad creative ways archivists and the public at large are using archival records to engage with the past. 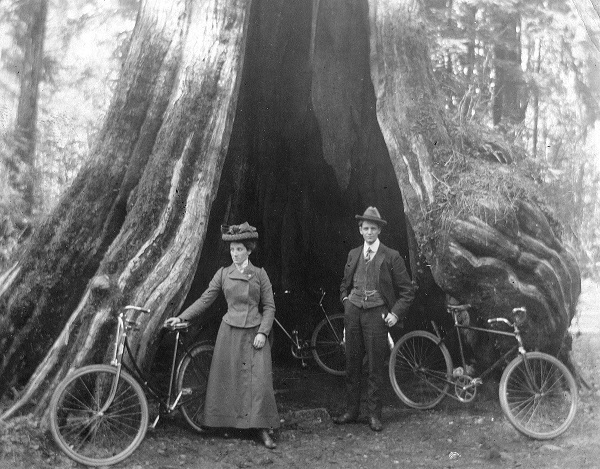 I would love to hear from anyone with more examples of inventive or innovative uses of archival material.